Snake head fish has been called with names such as Evil Snakehead, voracious fish, nightmarish creatures, predacious, awful and dreadful fish. A snakehead fish is a large, predatory freshwater fish native to Africa, Malaysia, Indonesia, and other parts of Asia. There are 28 varieties of snakehead fish. The snakehead is imported to the U.S. as a food fish and also for the aquarium trade where many thousands are sold every year as pets. 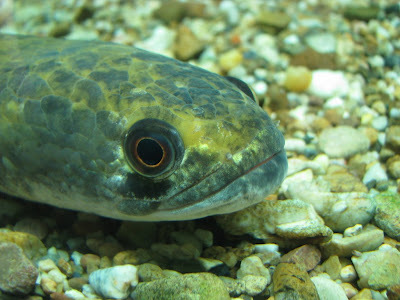 The snakehead fish is unique in several ways from most other fish. Similar in body-type to a muscular eel, some varieties can grow to 4 feet (1.2m) in length. The snakehead has a flat snake-like head and toothed maw, hence it's name. What makes the snakehead so unique, however, is its voracious appetite and its ability to breathe air. In fact the snakehead can travel short distances across land and live for up to three days out of water! It will eat fish equal in size to itself and will consume small mammals as well. There are even reports in Asia of snakeheads attacking and killing humans. 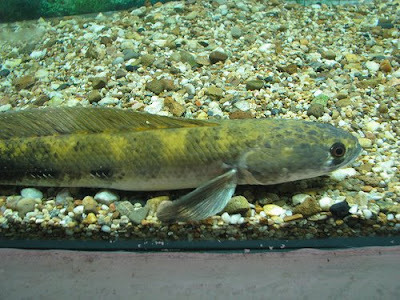 The northern snakehead is extremely adaptable to various climates including cold waters, and like all snakeheads, breeds easily. Adaptability, carnivorous appetitive, lack of natural enemies and ability to transverse land, makes the northern snakehead a real threat to U.S. waterways and indigenous species of fish and amphibians. Tropical and subtropical breeds of snakeheads can pose an additional threat to warmer waterways like those in Florida and Hawaii. Hi, i was just wondering... what is the type of snakehead pictured in this article. Why in the hell would you have a snake head fish? After much research, i have found out that it's an emperor snakehead. I would have one because they make awesome pets.